The International Observer of Science and Science Fiction - ZineWiki - the history and culture of zines, independent media and the small press. 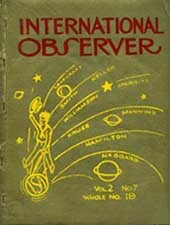 The International Observer of Science and Science Fiction was a fanzine edited by John B. Michel, Frederik Pohl, and Donald Wollheim in the 1930s. Michel was the chief editor for the first 16 issues (September 1934 to September 1936). Pohl took over the editorship for issues 17 to 20, and Wollheim was the editor for the twenty-first and final issue (June 1937). The Associate Editors were David A. Kyle and Arthur L. Selikowitz. It was published in Long Island City, New York, U.S.A. by William S. Sykora. Contributors included James Blish (The Planeteer), Daniel C. Burford, J. Harvey Haggard, Edmond Hamilton, David H. Keller, Clifton B. Kruse, Walter Kubilus, H. P. Lovecraft, Robert Lowndes, Lawrence Manning, A. Merritt, Raymond Palmer (The Comet), Florence Reider, Milton Rothman (Fantasy Fiction Telegram), Clark Ashton Smith, E.E. (Doc) Smith, William Sykora, F. Orlin Tremaine, Robert A. Waite, Jack Williamson, as well as the publisher, editor and associate editors. In 1937, John B. Michel and Donald Wollheim also co-published the humorous zine Terrible Tales of Tittering Terror, and on his own Wollheim edited The Phantagraph from 1935 to 1946. Frederik Pohl went on to edit Arcturus in 1938. This page was last modified on 26 January 2012, at 01:05.